The first thing that comes to my head having just finished what was an amazing read, is the film The Break Up. This is no doubt a story of love, life and friendship. 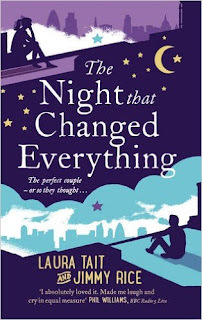 It's also a story of loss and finding yourself, however, where as most romantic/chick lit fiction have the usual thread of boy and girl meeting and a will they/ won't they synopsis which we almost always know as having that happily ever after ending, The Night That Changed Everything completely turned a romantic story on its head making this a really brilliant and refreshing read. We are introduced to Rebecca and Ben who seem made for each other, complete opposites but a couple bring out the best in each other. Within the first few chapters we are told how they met and where in their relationship they are - Rebecca's flat mate and best friend Danielle is about to move out, so it feels only natural for Ben to leave his flat mates, Russ and Tom, and to move in with her. The sub characters are featured fairly heavily within the book as they have a tight knit group friendship with Jamie (childhood friend to Ben and uni pal to Rebecca and Danielle)making up the sextet. As Rebecca and Ben's relationship reached the one year mark we see some beautifully romantic moments, however it is Tom's girlfriend Avril which drops a bombshell on Ben's birthday that changes the group dynamics forever. Obviously I'm not going to give away what the bombshell is, but it results in Ben and Rebecca breaking up, Rebecca and Danielle falling out and Jamie very much the friend trying to hold things together. As Rebecca plunges into work to get over Ben, he takes a different route and quits his job, not knowing what to do he takes up cooking in Jamie's bar. For a while, as much as I was enjoying the story, I wondered where it was going to go. It was hinted throughout that Rebecca and Ben needed to talk but opportunities where missed. When they finally went to get around to having the talk, their lives are again thrown in to the unknown when a tragic event happens. From this upset I was pleased to see the group move forward, it wasn't the ending I was hoping for as I loved Ben and Rebecca as a pair, but it was a really sweet compromise. Each chapter was told by either Rebecca or Ben's prospective and told in the first person. Rebecca was quite a hard character to begin with who showed little emotion whilst Ben had no problems sharing his feelings but it was nice to see him man up a little and focus eventually on what he wanted to do towards the end of the books and likewise to see Rebecca open up more. One character I really loved was Jemma... she came into the story half way through and somehow managed to befriend Rebecca, but she had a great, lively, straight talking vibe about her. Overall though, except for Avril, the characters were a really fun bunch and the book had me laughing and sniggering away. I really enjoyed the feel of The Night That Changed Everything, as I said it was refreshing having a love story introduced at the beginning and then get turned upside down... it keep me on my toes as I really didn't know where the authors were going with it!! I would like to thank Becky and Transworld books for an early copy of this book in exchange for my honest opinion.